As we move through the steps in the budget process there is much discussion in the community relative to the School Department’s budget proposal. We have become aware of a dialogue that is currently occurring on social media about the budget process, the proposed operating budget, the capital warrant article, and the plans for the Forestdale and Oak Ridge Schools next year. We are dedicated to being an information source for our families and the Sandwich community as a whole. As a result, we would like to provide information that will clarify a few misunderstandings that are currently being represented in social media and other mediums. Information in Response to Statements about “Free Cash” …. The superintendent has been represented in some circles as coining the phrase “free cash” as if he felt there was no cost to the taxpayer. Rather, the term “free cash” is a term generated by the Massachusetts Department of Revenue and is defined by the Department of Revenue as “the term used for a community’s funds that are available for appropriation. Specifically, free cash is generated when actual revenue collections are in excess of estimates, when expenditures are less than appropriations, or both.” These are funds that have already been collected and therefore expenditures from this account do not alter the tax rate. We felt that it was important for the voters know that they would not be voting for an increase in their taxes as a result of the school’s capital request in the February Special Town Meeting. Any and all references to “free cash” by the superintendent and principals have only been to inform the public using the appropriate fiscal language. On January 29th (Dr.) Canfield suggested that Forestdale take in the Integrated Pre-School and Spinnaker program, along with grades K, 1 and 2. Oak Ridge would house grades 3-6. On February 12th the superintendent said that there will be moving costs, etc. associated with the transition from Wing. He added that there is room for Pre-School and Spinnaker and there is a good space for the School for Early Learning. On February 26th, the Superintendent presented and update on phase two. Information was shared on enrollments and floor plans for Forestdale and Oak Ridge. His intent was to show that the PK-6 projected enrollments can be accommodated in two school buildings beginning in September 2015. He then went on to present a Power Point that explored two possible configurations for the schools. During the March 27th meeting questions were raised regarding the cost of reconfiguration. (Mrs.) Crossman asked for the one-time cost for building renovations for the PK-2/3-6 model. Dr. Canfield said he does not see that as being important to the final decision. He is already engaged in conversation with what needs to be done. If we reconfigure Forestdale as PK-2 it would not cost as much as it did to construct the new Central Office location which amounted to $65,000. After some questions were raised in public comment on the 27th and April 9th, the question about reorganization costs was raised at the April 9th Mrs. Crossman asked if Dr. Canfield’s report will have costs in it. Dr. Canfield said the only cost differential is the estimate for $25,000 for plumbing in the PK-2/3-6 model or $25,000 for redistricting with the two K-6 schools. He’s been told the portable classrooms have an estimated life of 8-10 more years, with initial repairs. No matter which model is used minor construction costs will be incurred. As you can see from the minutes, the $25,000 refers to additional costs based upon the model chosen, but that both model choices have construction costs as stated in the last sentence. The meeting notes indicate that the context of the conversation was a comparison of the costs of moving the students out of Wing vs the annual reccurring cost of keeping Wing open and making the necessary repairs to that facility. Additionally, on March 31, 2014 the superintendent met with a representative of the BoS, FinCom, and the SC per their request to discuss the fiscal impact of closing the Wing. Also, attending from the school department, was Michelle Austin, Director of Finance and Alan Hall Director of Facilities. At that time the superintendent revealed plans to reduce staff on the closing of the Wing. The plan discussed has since been made public. At the time the superintendent indicated that there would be costs associated that would require a one-time capital expenditure necessary to support the transition. Asked for a ballpark figure, the estimate was $350,000. Of that total, $25,000 was for lavatory changes in the west wing at Forestdale, if it became a PreK-2 School. It was based on the assumption that the west wing would be the best location for the district’s integrated preschool and the Spinnaker program. Since that time, a new principal (Marc Smith) moved to Forestdale and concluded it would be better to locate those two programs in the north wing. The total lavatory change order for Forestdale increased to $40,000. The additional $10,000 came from an Oak Ridge request to add additional stalls and sinks to two large bathrooms that had single units. The balance of the increase came from recommendations made by the joint town and school safety committee, thus accounting for the $65,000 increase in the one-time cost. This could be a misunderstanding that results from the legal language the School Committee needed to use after consultation with both school department and municipal attorneys. The minutes from March 27th, 2014 show that Mrs. Sundermeyer moved that the School Committee direct the Superintendent to work with the School Committee’s Counsel and Board of Selectmen to address vacating the Henry T. Wing School by August 2015, seconded by Mr. Andrade. The vote on this motion was unanimous. This work continues as a Memorandum of Understanding (MOU) is being developed between the municipal department and school department to address this motion. It has been noted that the school department operating budget includes between $250,000 and $300,000 next year to ensure the Wing School building does not fall into disrepair and become derelict in FY16. These funds have been added to the School Department budget; the money is not taken away from Teaching and Learning. If, instead, the maintenance of the Wing is the town’s responsibility, that amount would be shifted from the school department budget to the town budget. 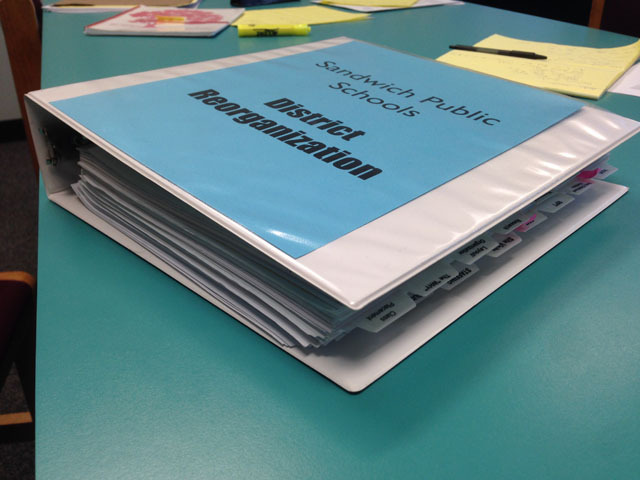 While the original plan discussed in the Winter/Spring of last school year discussed the possibility of the school department completely “walking away” from the Wing School Building next school year, further conversations between the municipal and school departments have concluded that the school department has the necessary staff and expertise to maintain the facility until such a time that the municipal department is ready to move ahead with future plans for the building. The costs would exist either way; they are just remaining in the school budget due to the fact that our staff will continue to maintain the building next year. On a related note, nearly 75% of any school budget is made up of staff salaries. The school leadership team has openly and publicly stated on numerous occasions that the majority of savings from the closing of the Wing school would come from the consolidation of resources when we no longer have a triplication of efforts in some areas; this includes our staff. Additionally, having all grades under the same roof we will be able to have more consistent class sizes (no larger than we have had in any one school), rather than instability we historically experienced from year to year due to the way the town is currently divided into three “sub-districts.” The reductions proposed in the budget result in a 1.56% decrease in the operating budget from FY 15, which resets the base level of the budget downward and saves taxpayers money this year and each year after. Information in response to questions about the health class planned for Oak Ridge. No changes have been made to this original proposal. Mrs. Hill is still planning on including a Health class in the program for students at Oak Ridge. Information in response to questions about whether Oak Ridge will be nine classrooms short next year. No. The Oak Ridge student population will require 41 homerooms next year. There are currently 40 classroom spaces to serve this role, which do not include the portable classrooms. Options are currently being explored to create the one additional space. One option includes the renovation of the library to create a classroom in the section that currently houses the library computer lab. The portable classrooms will be used by some students throughout the day, just as they were used last year when grade 7 and 8 were in the building and had World Language classes there; however, the portables will receive a renovation (flooring, ceiling, roofing, paint and HVAC – Heating, Ventilation, Air Conditioning) before this happens. One of our goals this year as an Administrative Team is to provide accurate information to families and to the community. Whenever possible, we provide links to the sources of our information. In this article, we include links to the MA Department of Revenue, School Committee meeting minutes, other Sandwich Learns Together articles. Please also remember that all Sandwich public meetings are archived on the Sandwich Community Television website. The budget process is complicated. This year, the School Department increased collaboration and transparency by holding their Budget Workshops with the Finance Committee around the table. The Finance Committee had the opportunity to get their questions answered. You can watch the first budget workshop regarding staffing here . The second budget workshop regarding expenses is posted on the Sandwich Community TV site.